CarGurus has 8,629 nationwide RX 350 listings starting at $4,257. 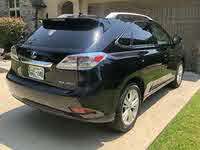 A sublime ride, decidedly high-end build quality, a quiet, spacious and well-appointed cabin, plenty of cargo space, available all-wheel drive and a standard V6 engine all allow the 2012 Lexus RX 350 to ooze luxurious practicality. Big-buck options packages, some distinctly unexciting handling characteristics, and the lack of a third row of seating cut the otherwise classy 2012 RX 350 down to size. The average family looking for a reasonably priced, well-made luxury-oriented automobile could easily fall for the 2012 RX 350. This handsome ute’s shapely profile will look good at home, at the cabin and at the building supply center, while its civilized if slightly bland driving dynamics will keep the commute comfortable and convivial. Not designed with rock climbing or the Baha 100 in mind, Lexus’ entry-level crossover is nonetheless practical, princely and potent—altogether very good at what it does. For the truly high-living single guy or gal, perhaps only a Lamborghini or a Porsche will do. On the other hand, for the fairly well-off family who needs a midsize luxury crossover SUV that’s practical, comfortable and drivable, there’s the 2012 Lexus RX 350. This 5-passenger premium mini-ute might not be the most agile drive on the block, nor the fastest, nor even the sexiest. It does, however, offer plenty of ride and cabin comfort, a decently potent V6 and, at 80 cubic feet with the rear seats folded, some impressive cargo capacity. Of course, a veritable cornucopia of high-class touches and state-of-the-art techno-goodies grace this princely conveyance, which, except for an added appearance package and the fact that the standard V6 will now cruise just fine on 87-octane regular unleaded, stands pat from 2011. A single trim level, known somewhat understatedly as the Base, once again constitutes the entire RX 350 spectrum. Though front-wheel drive (FWD) is the standard powertrain configuration, this cute ute can be delivered with all-wheel drive (AWD) for those folks who have to contend with stuff like snow, ice and mud. The AWD system remains focused on the front wheels in normal driving conditions, transferring torque automatically, instantaneously and seamlessly from the front wheels to all wheels when necessity dictates. Additionally, the touted Remote Touch feature and voice-recognition technology available in Lexus’ available navigation suite has reviewers and owners alike praising their simplicity and intuitiveness. The former uses a mouse-like controller interfaced with a dashboard-mounted touchscreen display to control navigation, audio and communications functions, while the latter also interacts with the navigation and Bluetooth communications systems for audible directions and phone use. Though most reviewers laud the techno-features aboard Lexus’ crafty crossover, a few glitches in the voice-recognition system have been known to cause some frustration among owners. Rivals in the luxury crossover market, including the Buick Enclave, Lincoln MKT and the Mercedes-Benz R-Class may be larger and offer available third-row seating, but may also be a bit more cumbersome to drive. Others, including the Acura MDX, BMW X5 or the Infiniti FX35 will likely offer a headier driving kick, but may come up a tad short on utility. All in all, those browsing this crowded niche would do quite well in choosing the RX 350. 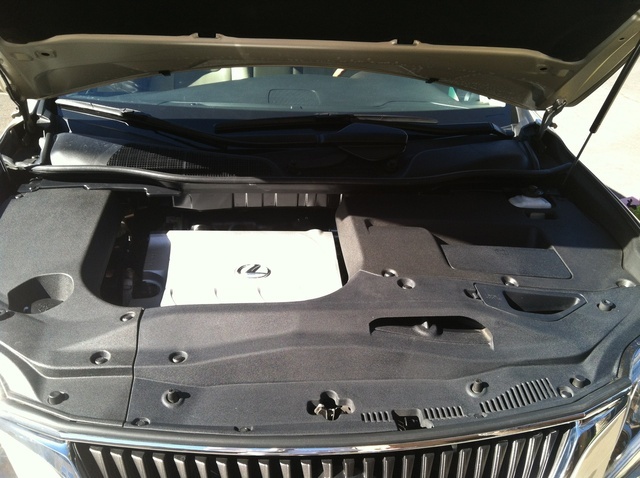 The only engine offered in the plush 2012 RX 350 is a 3.5-liter variable-valve-timed (VVT) V6. Mated with the standard 6-speed shiftable automatic transmission this peppy powerplant will put out 270 hp at 6,200 rpm and 248 lb-ft of torque at 4,700 rpm. Last year, with the six-banger burning only premium-grade gasoline, the figures were 275 hp and 257 lb-ft of torque. Curiously, at least one test had the 2012 FWD version scooting from 0-60 in 7.1 seconds, same as the 2011 versions. Lexus’ own testing, however, showed a rather more believable 0-60 time of 7.8 seconds. Anyhow, with the available towing package, this Lexus can haul some 3,500 pounds, while mileage should be in the vicinity of 18 mpg city/25 highway in the FWD edition and 18/24 in the AWD configuration. As with the 2011 Lineup, Lexus’ RX 350 AWD boasts a viscous, center-mounted limited-slip differential and what’s essentially part-time AWD. Reviewers remain impressed with the V6, despite the slight drop in performance using 87-octane gas. Nevertheless, the six-banger is touted as sounding potent yet refined during hard acceleration, and the ponies are ready and willing to give more even at highway speeds. The 6-speed shiftable automatic is noted as smooth and responsive, quick to downshift when a tad more giddyup is needed. 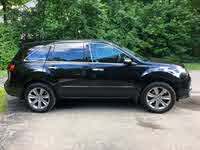 Among those attributes most highly endorsed by those in the know is the 2012 RX 350’s heavenly ride comfort. Of course, this high-end ute retains the 4-wheel independent suspension, as well as the MacPherson front struts, the double-wishbone rear end and the stabilizer bars fore and aft, from last year. The 18-inch alloy wheels and standard all-season tires, moreover, keep a decent grip and level out all but the most degraded surfaces, according to reviewers. 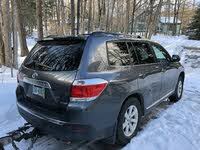 One review even dared to compare this practical crossover’s ride to that of a luxury sedan. However, should the available Sports Package, with its sport-tuned suspension and 19-inch tires, be selected, reviewers note that the ride is noticeably less compliant, though driving excitement improves dramatically. In its standard configuration, Lexus’ cute ute is often panned for its somewhat bland handling characteristics, including some body lean and noseplow in faster curves. The Sports Package, with its sure grip and beefed-up undercarriage, changes all that, and gives the average type-A commuter an opportunity to test his or her skills on those winding back roads. Finally, though brakes are described by the majority of reviewers as strong and true, with little pedal fluctuation, at least one braking test of the RX 350, from 60-0, found it taking an average of 10 feet longer to come to a full stop than comparable crossovers. In keeping with its posh pedigree, the 2012 RX 350 is delivered with more than its share of standard amenities. There are, for example, the rear spoiler, roof rack and heated reverse-tilt power-adjustable mirrors that grace the exterior, not to mention cloth upholstery and 8-way power-adjustable front bucket seats. Reclining rear seats, cruise control and telescoping tilt-wheel steering add a boatload of convenience, while a leather steering wheel and leather, alloy and wood cabin trim accents let all and sundry know that they’re in the presence of a crossover that’s a cut above average. Entertainment is, of course, not neglected. Expect, therefore, the MP3-capable 6-CD changer with 9 speakers to be bolstered with a standard USB port and auxiliary iPod interface. Bluetooth hands-free technology also remains standard, naturally, as does the Lexus Enform Safety Connect telecommunications system. Options are plentiful and mostly in package form, though 19-inch aluminum wheels, a 12-speaker Mark Levinson premium audio system and a head-up display are available by themselves, as are heated front seats and remote engine start. Bundled options start with the Premium Package, which is necessary to get all the higher-end packages, including the navigation suite. Meanwhile, GPS-based navigation, enhanced Bluetooth and upgraded Enform technology, as well as a rear-view camera, the Remote Touch display and controller, and rear-seat entertainment come in the Rear Seat Entertainment System with Navigation Package, while high-intensity-discharge (HID) headlights, heated front seats and rain-sensing wipers are included in the Comfort Package. The brand-new Appearance Package offers 19-inch seven-spoke chrome wheels, halogen headlights and redesigned headlight bezels, while the Luxury Package boasts leather upholstery, driver memory settings, a power moonroof, a power liftgate and a side-view camera. The Sports Package, finally, includes upsized wheels, the sporty suspension and driver-selectable Vehicle Dynamics Integrated Management (VDIM) traction enhancement. In general, reviewers are impressed with the RX 350’s posh interior, noting that most techno-gizmos are intuitive and reasonably easy to use, gauges are large and readable, seats are long-road comfortable and the cabin is an island of calm in what can be a sea of road-born chaos. Visibility is described as tolerable overall by most reviewers, though the large roof pillars in each rear corner somewhat inhibit sightlines to said corners. Alas, those fold-flat rear seats don’t fold quite as flat as they could, according to virtually all reviewers, while the sloping roofline may challenge the loading of bulky cargo. Cabin stowage space, finally, is noted by a number of reviewers to be a bit on the stingy side. In keeping with tradition, Lexus has endowed the 2012 RX 350 with the usual high-end safety equipment. Standard 4-wheel antilock brakes, with electronic brakeforce distribution and emergency braking assist, are bolstered by traction and stability control, which can, in turn, be complemented in the available Sports Package by the VDIM system. Front and rear head airbags are standard, as are dual front side-mounted airbags and front head-restraint whiplash protection, while daytime running lights, front fog/driving lights and turn-signal-integrated mirrors also come with this well-wrought crossover. A post-collision safety system and a remote antitheft alarm, meantime, round out the more notable standard safety items aboard. Options-wise, a pre-collision braking system comes with the available radar-interfaced dynamic cruise control system, while the self-explanatory Intuitive Parking Assist program for the parallel-parking challenged, not to mention glass breakage sensors, can also be added. The National Highway Traffic Safety Administration (NHTSA) gives the 2012 RX 350 4 stars in overall safety, its second-highest rating. Four stars were awarded in front crash testing and rollover tests, while their best 5-star status was awarded in side-impact testing. Meantime, the Insurance Institute for Highway Safety (IIHS) gives this high-end ute its best rating of Good in front offset, side impact and roof strength tests, and has awarded the RX 350 a Top Safety Pick nod for 2012. Some unexpected rattles and an over-abundance of engine noise are among the glitches noted by owners of Lexus’ 2012 RX 350. This well-endowed ute’s less-than-inspired driving characteristics also leave a number of owners cold, with a few complaining of a distracting tendency toward wallowing at cruising speeds. In the opinion of one or two owners, gas mileage could be a bit better, while others note that the standard audio system seems a bit sub-par for a ute in this higher-end niche. Several owners complain that cabin storage could be more plentiful, while a few others denounce the frustrations of the voice-recognition system. The lack of power-folding rear seats leaves a few owners scratching their collective heads, while several more grouse that those same rear seats don’t fold quite flat, thus presenting some minor storage hassles. On the positive side, a majority of owners rave about the RX 350’s ride comfort, and especially about its high stance and user-friendly driving tendencies. The recently acquired ability of this top-shelf crossover to burn regular unleaded gas sits mighty well with owners, who also rave about its peppy acceleration, distinguished profile and refreshingly easy-to-use techno-features. What's your take on the 2012 Lexus RX 350? Users ranked 2012 Lexus RX 350 against other cars which they drove/owned. Each ranking was based on 9 categories. Here is the summary of top rankings. 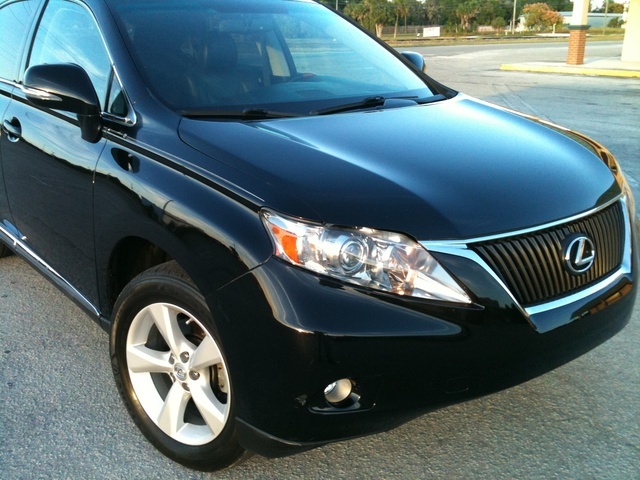 Have you driven a 2012 Lexus RX 350? 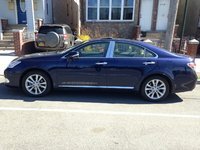 My 2012 Lexus, all of a sudden, will open the garage door but not close it, what is wrong? Will 2012 Lexus RX 350 Lock By Itself? If I walk away and forget to set the alarm/lock my 350, will it lock itself after a certain period of time?